In recent years as Russia has become more and more conservative, chauvinistic and alien to its own young inhabitants, Tima Radya has become one of the only artists who seems to easily confront the powers of the old and evil, knowing it’s deepest secret: the system is doomed to collapse. Tima Radya is known in Moscow and New York (where he won CutLog in 2013) although his first-hand audience is still the citizens of his native city Yekaterinburg in the Ural Mountains, where his distinctly urban messages undermine their daily routine. Radya gracefully transforms familiar environments – bridge pillars become dominoes, snow turns crimson and lamp shades appear on the outdoor lights. He fills the city with oddly personal messages on an incredibly large scale. "For sure I don't know much of you as you of me, but now we have something in common" on an anonymous metal billboard in in the middle of bleak cityscape. It’s about everyone, in every city. Recently, Radya started a new series of works Figures addressing the actions of Russian government. Figures is set out of the city, in the deserted snow fields and involves long-term preparations and complicated installation work. "Figure #1: Stability" is a house of cards built from riot police shields, a metaphor for how tenuous power built on suppression is. 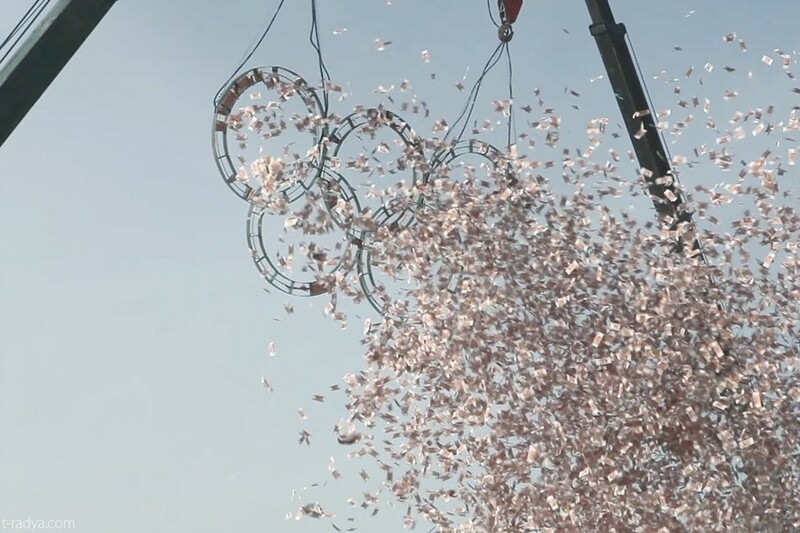 "Figure #2: Game" is a practical demonstration of the $50bn spent on the Sochi Olympics: thousands of rouble bills being blown away from the steel carcass of the Olympic rings. Radya’s works are pure, fearless honesty and the current government can’t bear it. Here Dazed speaks to Radya about the laws of the street and the city, political art in today’s Russia and the perils of purchasing riot police uniform. Dazed Digital: Do you remember how you got involved in street art? Tima Radya: I started doing street art when I bought a ladder, or maybe the other way round, I don’t remember. It was four years ago. I graduated from the Faculty of Philosophy and like all graduates with a philosophy degree I had a question What Is To Be Done? I decided to do street art as it's one of the most effective languages of contemporary culture. DD: How do decide on a project? Tima Radya: I just realise that I cannot help but do it. More precisely, it’s not a thought but a feeling, a really rare and special feeling. If I have an idea I can’t give it up, you can’t abandon your ideas, that’s the rule. DD: Do you have a team you do large-scale stuff with? Tima Radya: Of course, I do all my works with friends. Working on the street requires speed and precision, and it’s impossible without their help. They are my best friends, reliable and accurate mechanism, we understand each other perfectly. DD: What’s so special about Yekaterinburg as a street art playground? Why do you think the street art scene is so prolific there in spite of extreme low temperatures in winter? Tima Radya: It’s a misconception actually because there are lots of great street artists in Russia and only some of them come from Yekaterinburg. But I think the answer is the city scale, there are 1.5 million people: not too many but not too little. The space is still human unlike huge metropolises like Moscow or New York where you’re often no more than a grain of sand. Yekaterinburg has a high concentration of street art and it enhances its explosive nature. DD: How does it feel to live in a city full of your works? Tima Radya: I'm quite shy but it’s good that my works have endured. DD: Could you ever work in another city or country? Tima Radya: Yes but there are certain complications. One of the functions of street art is to break the pattern of mundane routine, time and people’s attention. You need to not only understand and feel the city very well but to live in it, it’s a big difference. It’s like a stranger, acquaintance and someone you're very close to all at once. DD: Why did you choose the field for Figures #1 and #2, not the city? Tima Radya: The snow field is the perfect space, it’s clean and very Russian. Visually this neutrality is close to the sterile spaces of galleries and museums. But genetically they are different, the field is not sterile, it’s full of winds, light and myths. DD: Do you have plans for Figure #3? Tima Radya: I always have plans. There are certain elements but I can’t yet put them together. You can’t do it on purpose, they come together organically. I think it will happen instantly and really soon, sometimes when I'm on my bike or a plane: when you’re rushing from the mountain or above the clouds, your thoughts shake down. Everything falls into place. DD: Have you ever had problems using the riot police uniform in your works? Tima Radya: No, it’s just camouflage uniform with patches, anyone can buy it. You just say you need it for a theatre performance (I didn’t even have to lie in a way). I was interrogated a couple of times but I don’t think it’s a problem, it’s part of my job. An artist’s duty is to speak, and I’m ready to take responsibility for my words. It’s not a crime but it’s interesting. DD: What does it take to be a street artist? Tima Radya: You need to be gentle and tender inside but outside you've got to be harder than rock. Tima Radya: The first illegal space flight.